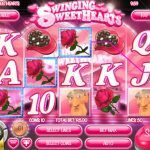 Swinging Sweethearts is a 5 reel and 20 paylines slots game released in 2015 by Rival. This is based on an old couples TV show where the couple needed to answer correctly questions about each other. So if you’re a fan of the concept and you love pink then this might be the game for you. The Wild in this game is the Hostess symbol. 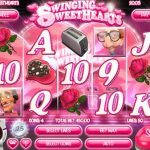 It will help you complete winning combinations and will come with a nice 4x multiplier. There is one scatter in this game and it is the TV Show Host. 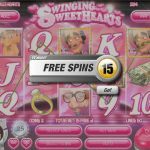 Landing 3 or more anywhere on the reels will win you 15 Free Spins. Here is the nice part, any win during this round will come with a very generous 8x multiplier. The graphics here is very nice and you can see this is a pretty recent game. The main thing we don’t like is that it is too much pink. We know this is personal so it might not bother you. Other than that, the lack of bonus round is a bit disappointing and the RTP is just ok at 95%. Are you missing the summer? Try playing Summer Ease a 5 reel slot by Rival.